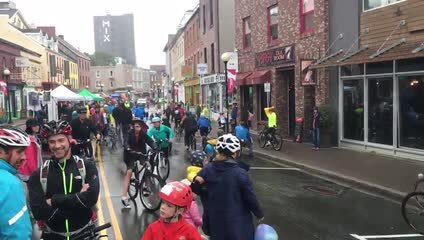 The City of St. John’s is developing a new Bike Master Plan with the help of Trace Planning and Design, Stantec, and the Planning Partnership. This new plan is an update to the 2009 St. John’s Cycling Master Plan. where and why do people currently ride bikes? what are the barriers and opportunities for cycling in St John’s? See the Preliminary What We Heard for a summary of results. In January 2019, a draft bike network map and vision statement were shared for public feedback. The draft network plan aims to connect residents to their neighbourhoods and the greater region using natural areas and street corridors that link economic, recreation and cultural destinations. Please have a look at the Draft Network Overview Maps and the Information Note for Council for more details. February 13, 2019 update: Online survey is now closed. Thanks to everyone who participated! Your input currently is being used to refine the draft network map, validate the vision statement and develop the Bike St. John’s Master Plan. Stay tuned! Sign up for project updates using the link on the right sidebar. We expect the Bike St John's Master Plan to be completed in spring 2019. From January 23 to February 12, an online survey asked for your feedback on the draft vision statement and draft bike network map. Your input currently is being used to refine the draft network map, validate the vision statement and develop the Bike St. John’s Master Plan. January 23, 2019: new survey is open! A draft bike network map and vision statement are being shared for public feedback. Please have a look at the Draft Network Overview Maps and the Information Note for Council for more information. Your input will be being used to refine the draft network map, validate the vision statement and develop the Bike St. John’s Master Plan. This will include a summary of public engagement results, a bike network map, and recommended actions. Having trouble navigating this page?